Sympli Women’s Multi Plus is a nutritional complex, containing many various nutrients and herbs, even antioxidants. Sympli Women’s Multi Plus is indicated for the reduction of dependence on solitary supplements, such as Calcium tablets. It is also indicated for the specific nutritional needs of women over 40 year old, and those experiencing the peri-menopause, menopause, and post-menopause stages of life. Vitamin c- Shows insufficient evidence in relieving mental stress. Thiamin– Thiamin has been shown to relieve stress and help with aging. Niacin– Shows insufficient evidence for helping with migraines, headaches, dizziness and depression. Folate- Folate has been shown to help with depression. Calcium- Calcium can reduce the symptoms of PMS. 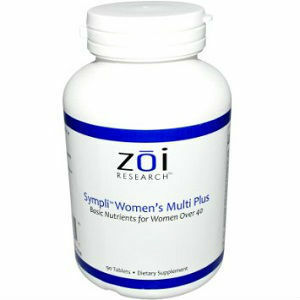 The recommended dosage for Sympli Women’s Multi Plus is 3 tablets daily. One bottle of Sympli Women’s Multi Plus is $7.09. It was $17.07, this means you save $9.98. Our research did not uncover any guarantee of any kind. Sympli Women’s Multi Plus simply does not come with a guarantee. Sympli Women’s Multi Plus is a good product, and contains many ingredients and nutrients that are very helpful to women’s bodies. However, it comes with no guarantee, and requires high doses. While the ingredients are helpful to the body, most of them are not clinically proven to be effective for menopause relief. Jackie Horowitz	reviewed Zoi Research	on April 10th	 and gave it a rating of 2.